← Theme-a-licious and more !! One week down and I got as far as casting on my socks I’ve chosen for the sock KAL. I know it doesn’t seem like much but after casting on and doing two rows I only got picking these up for one evening ! I like the pattern so far and its something I’ve not done before. I’m using Opal’s Faeries and Elves yarn for these and I’m hoping it won’t hide the pattern to much, we shall see as I knit more as its quite hard to tell at the moment how it will go. This entry was posted in Uncategorized and tagged Right Twist Cable Rib Socks. Bookmark the permalink. It may look small but socks are slow going, aren't they? I hope you have more time for them this week. I like the colours on that yarn. I like the little twists your pattern has in it! Love the name of the yarn too! Your socks so far look lovely, the yarn s pretty and what a nice name. 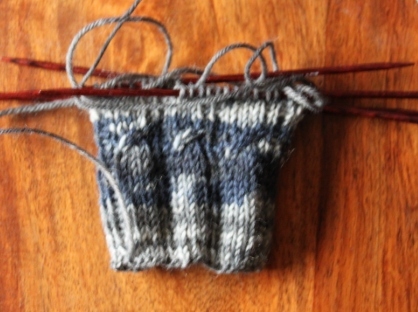 My socks have noted as much look in as they should have…..wouldn't it be nice to have forced knitting time each day?! Looks good so far 🙂 The yarn is quite lovely. Lovely yarn choie Ruth. Can't wait to see more of these little socks! I love those delicate little cables, these socks are going to be gorgeous!